Known at the time as the Great War, or the World War, this conflict was not known as World War I until 1939, as there was not yet a second war and so no need to differentiate. The Great War began in July of 1914 and was waged until November 11, 1918. It involved every major nation in the world, lining up on two sides: The Allies and the Central Powers. World War I was started by an almost insignificant event -- if such an event can be called insignificant. But the assassination of Archduke Franz Ferdinand of Austria was the ignition of the tinder that surrounded the dynamite which turned into World War I.
Ferdinand's formal title was the Archduke of Austria-Este and he was the Royal Prince of Hungary and of Bohemia, and until his death, he was was the heir to the Austro-Hungarian throne. His parents were the Archduke Karl Ludwig of Austria and Princess Maria Annunciata of Bourbon-Two Sicilies, and though he was not born the heir to the throne, he became just that at the age of twenty-six when his cousin, the Crown Prince Rudolf and his mistress consummated what historians term either a murder-suicide or a suicide pact at the Prince's hunting lodge. Ferdinand's father was actually the next in line to the throne, but he he renounced the throne and died of typhoid fever very shortly after that. Ferdinand was, by most accounts, strange and not without anger issues, with an aura of violence. He was fond of hunting emus and kangaroos in Australia, and personal trips to such faraway places as Hong Kong, Japan, New Zealand, Thailand, New Guinea. He kept a diary of his hunting trophies with a recorded 300,000 game kills, many of which were stuffed and mounted. Nearly 100,000 of his trophies were on exhibit at his castle. He fell in love with Countess Sophie Chotek, a Czech aristocrat who was not a member of a reigning dynasty in Europe, which made her ineligible to bear heirs to the throne. She was a lady-in-waiting to a countess, which made her even less of a possible mother to an heir to the Austrian throne, and the Emperor, Ferdinand's uncle, made it clear to the Archduke that he was forbidden to marry Sophie. A small scandal ensued, as he refused to marry a princess, and Ferdinand and Sophie carried on a secret love affair for at least three years, through his bout with tuberculosis and subsequent convalescence. In 1899, Ferdinand was finally allowed to marry Sophie, as long as they agreed that none of their children would be in line for the throne. Furthermore, she would not be allowed to appear with him in public most of the time nor ride in any royal carriage or even sit in the royal box at the theater. They were married in 1890, with no royals in attendance other than Ferdinand's stepmother. Although Sophie would eventually be given the title Princess of Hohenberg, she paid great deference to other princesses and bore such humiliations as not being allowed to stand near the Archduke in receiving lines, her position being much further down the line than he or other royals. Together, she and Ferdinand had three children: a girl and two boys, and had a stillborn son, between 1901 and 1908. The revolutionary group known as "Young Bosnia" consisted of young revolutionaries from Bosnia, Serbia, and Croatia. It had been founded in 1908, days after Bosnia and Herzegovina were annexed by Austria. The mission of Young Bosnia was to set free Serbs who were now under the rule of Austro-Hungary. Princip, who was 19 years old at the time, was one of a handful of assassins which were organized by the secret military society made up of members of the Serbian Army known as the Black Hand. The Black Hand was created with the goal of creating a "Greater Serbia" using whatever tactics were necessary, including terrorism, guerrilla fighters, sabotage, and political assassinations. The conspiratorial group was founded in 1901 by ten members. By the time of the assassinations of Ferdinand and Sophie, it had between 700 and 2,500 members. In 1903, they had carried out the political murders of the young King of Serbia Alexander I of Serbia and his wife, Queen Draga. The king and queen hid from the conspirators in a cupboard, but after a search of the palace, they were discovered in their hiding place. The murderers dismembered the young couple, throwing body parts out of the window of their second story living quarters. The Central Powers were made up of the Austro-Hungarian Empire, the German Empire, the Ottoman Empire, the Kingdom of Bulgaria, the Emirate of Jabal Shammar, and the South African Republic. The Triple Entente was made up of the French Republic and the British and Russian Empires. The secondary members of the Entente were Serbia, Belgium, Japan, Greece, Montenegro, Romania, and the Czechoslovak legions. The Kingdom of Italy and the United States eventually joined with the Entente, as did Finland and Poland, rounding the Allies of World War I. 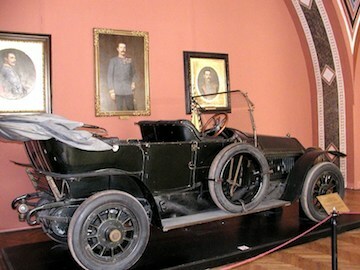 On June 28, 1914, Ferdinand and Sophie were being driven to the City Council of Sarajevo when Young Bosnia member Nedeljko Čabrinović threw a grenade at their car. It did explode, but by the time it did, the car had passed the site of the explosion, and the occupants of the car behind them were injured. When they arrived at the Governor's residence, an enraged Ferdinand shouted at the Governor, "So this is how you welcome your guests: with bombs?" Once he had calmed down, the couple decided they would go to the local hospital to see those who had been hurt in the grenade attack, but no one told the drivers that the route had been changed in order to accommodate that desire, and this caused a traffic problem when the drivers turned around to go to the hospital. The cars went back down the street, and as they turned into a side street, many of the cars stalled. Princip, by chance sitting in a nearby Sarajevo cafe took the opportunity to saunter across the street and shoot the royal husband and wife. He shot Sophie in the stomach first and then shot Ferdinand in the neck. She died before they got to the hospital, and he died moments afterwards. That very day Austria invaded Serbia in retaliation for the murders. Shortly after, Austria turned its wrath on Serbia's ally Montenegro. At the same time, on the Western Front, Belgium and Luxembourg -- both neutral countries -- suddenly found themselves occupied by German soldiers. On July 28, Austro-Hungary declared war on Serbia; on July 30, Russia declared war on Austro-Hungary. On August 1, Germany declared war on Russia and Monaco declared war on Germany. On August 3, Germany declared war on France, and the next day on Belgium. On August 5, Montenegro declared war on Austro-Hungary, and the next day, Austro-Hungary declared war on Russia, and Serbia declared war on German. On August 9, Montenegro declared war on Germany. On August 11, France declared war on Austro-Hungary; and on the next day, the United Kingdom declared war on Belgium. On August 22, Austro-Hungary declared war on Belgium. Japan declared war on Germany on August 23 and on Austro-Hungary on August 25. The Kingdom of Italy turned its back on the Central Powers and joined with the Entente in early 1915. The United States, which had been neutral in order to "avoid foreign entanglements" as George Washington had urged in his Farewell Address, was goaded into the war in 1917 after it became apparent that Germany was attacking international shipping and plotting to attack America. They were joined by their allies Greece, Siam, and Liberia. World War I raged on until November 11, 1918, less than two weeks after the Austria-Hungarian Empire was dissolved, yielding numerous nations including Austria, Hungary, Bosnia and Herzegovina, Slovenia, Slovakia, Croatia, the Czech Republic, Serbia, Romania, Ukraine, Poland, Italy, and Montenegro. The focus of this website is World War I, its causes and people. Discussions are about the battles and experiences of those who fought the war. Topics such as the assassination of the Archduke Ferdinand, the beginning of air warfare, Gallipoli, and America's entry into the war are found here. The Red Baron is also written about here. Multimedia history contains background information, battlefield tours, battles, who's who, and a gallery of propaganda posters. Also displays diaries and memoirs of those who lived through the war and that era as well as poetry and stories of the time. Examines the causes of war, the war itself, including diplomatic and military history, and personal accounts of those who fought in and witnessed the war. Also details the war resistance and literary responses. Presents an archive of primary documents from the Great War with treaties and official papers, diaries, personal reminiscences, and a section with images. Search for World War I on Google, Bing, or Yahoo!